Luxury Oceanfront Condo with Spectacular Views! 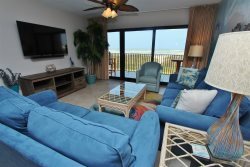 Come enjoy the incredible views that await you from every window in this beautiful oceanfront condo! The great room and master bedroom feature a wall of floor-to-ceiling windows and sliding glass doors that lead out to the 26 foot balcony. Here you will enjoy watching the Gulf of Mexico and the beautiful sunrises that await you daily! The balcony is the perfect place to start your day with a freshly brewed cup of coffee or to relax with a margarita at the end of a day on the beach! This stylishly decorated codno elegantly brings the outdoors in with palm tree accents. The great room provides plenty of seating with a comfortable sleeper sofa and side chair with ottoman. You will enjoy spectacular views of the Gulf and the beach from the comforts of the sofa while you enjoy the LCD TV with Cable and HBO. There is also a DVD player if you plan to rent or bring movies with you. Wireless internet is provided. While preparing your daily meals in the fully equipped and recently renovated kitchen you will be able to enjoy the breathtaking views of the ocean out the great room’s wall of windows! There is seating at the kitchen bar for a quick bite to eat and seating for 4 at the dining room table. This Luxurious condo features a Keurig machine. There are two bedrooms and two baths in the condo. If you choose to lounge in bed for a late relaxing morning you will enjoy watching the ocean out of every window in the master suite which features a king size bed and a private bathroom. There is a brand new Memory Foam mattress on the King bed to ensure that perfect night's sleep and the bathroom has been 100% renovated. It has a very luxurious shower head. The guest bedroom features a queen and a twin bed. It has direct access to the hall bathroom. Both bedrooms come with LCD TVs. Love it! Cant wait to go back!